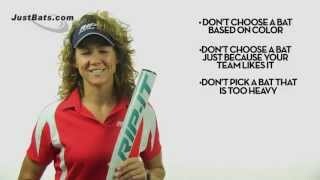 Today we’re going to talk about Senior Softball bat rules, the SSUSA. If they say Official Softball on the bat, that means they’re usually legal for it. If they have a BPF stamp of 1.21 or under, they’re usually legal. Almost all ASA, USSSA, NSA bats are all legal in Senior Softball. That’s where you find your Miken Ultra 2s, bats like that. Another thing to remember is that if your bat exceeds 1.21 BPF it will not be legal in Senior Softball. 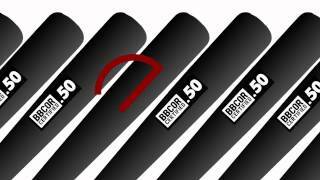 If your bats are dented, warped, cracked, you know, in any way real rough, umpires aren’t going to let them fly, guys, so take care of your bats. Another thing to you bat doctors out there, don’t shave roll your bats. Use what you get. You know, they’re hot enough already. If you use a shaved bat you’re going to look at a five-year to a lifetime ban from Senior Softball for swinging a doctored bat, so don’t do it. 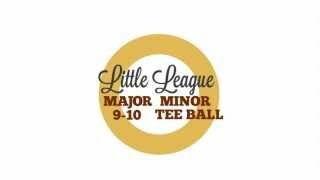 Any other questions you have, you know, come to JustBats.com and remember, from click to hit. 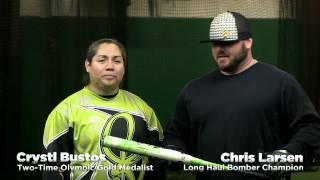 Crystl Bustos & Chris Larsen Swing the 2014 DeMarini Mercy Slow Pitch Bat!